Life is good! This year’s mentoring program has kicked off to a roaring start. This marks the 13th year that esteemed chapter members step up and help new technical communicators become even more awesome. Dan Voss and Bethany Aguad present an excellent feature article on this topic at the end of the newsletter. 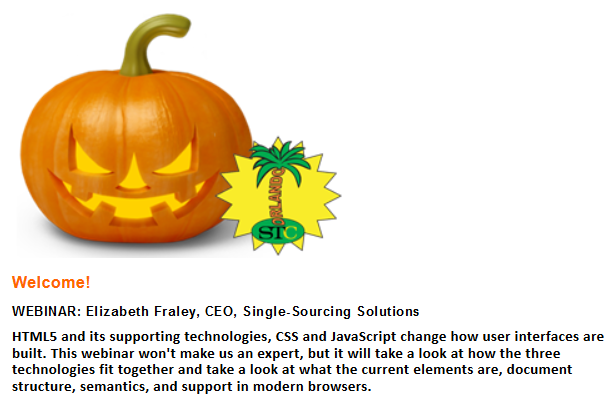 We have a meeting coming up on Tuesday. Do you wanna know who’s presenting it? (Of course you do.) It’s one of our new Mentor and Mentee pairs! The tie-in couldn’t be more perfect if we’d planned it! Anyhow, here’s the need-to-know information. You might call me biased, but I highly recommend that you come and join us this month. I prefer to call it a hunch. Please click here to RSVP and for further information, regardless of mode of attendance! For virtual attendees, we’ll provide more information upon registration. And for now, dear communicators, I must bid you farewell. This is our last issue for the year. May your documents be merry and bright, and your content strategy always as delectable as a fresh ginger snap. In the spirit of the season, Mr. Armstrong used a Halloween themed approach by including horror film references to exemplify his material. Among the wonderful references, the general message was how horrific these information silos are to a company by creating uninformed clients. They breed ignorance, creating an environment where everyone blames everyone else, wasting time and money. A technical solution along with the proper support can help break down these barriers and open information up to the client, which improves efficiency. What I took away from the meeting was how important technical communicators are to a company. Even though it seems many employers out there do not comprehend our purpose or applicability, examples like Rhyne’s certainly brighten one’s day. Triskaidekaphobics (Google it) would tremble as the Orlando Central Florida STC Chapter and the Future Technical Communicators (FTC) organization at the University of Central Florida (UCF) embark on Year 13 of a flourishing student mentoring program. No bad luck here! 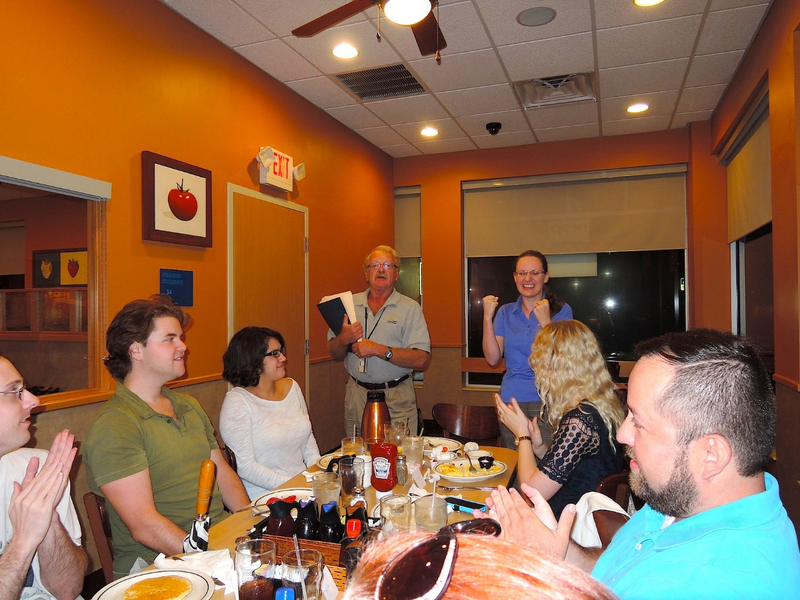 Energy and enthusiasm crackled through the meeting room at the IHOP on October 27, as mentoring program coordinators Dan Voss and Bethany Aguad introduced the mentors and mentees (M&Ms). As they found their common interests, the M&Ms defined goals and planned activities for their partnerships, which will run through June 2016. The mentoring kickoff was doubly sweet as it signaled the resurgence of FTC with a full panel of officers following a near-total turnover of membership last year. Perfect Attendance, Perfect STC Enrollment! For the first time ever, the program coordinators were delighted to achieve 100% attendance at the kickoff. Moreover, all nine mentees are now card-carrying STC members! Treasurer Alex Garcia ran through his supply of checks as he issued the chapter’s $20 student membership rebates to the eight new student members—boosting the OCF Chapter’s membership by approximately 12% in one fell swoop. The ninth mentee was already an STC member in the New Technical Communicator (NTC) category. The 18 mentors and mentees pairings (see below for Introducing… the Mentor/Mentee “Class of 2015-2016”!) were based on common mentee interests and mentor areas of subject matter expertise, schedule availability for meetings, preferred problem-solving style, and hobbies. The well-matched mentoring “Class of 2015-2016” brings the total number of one-on-one mentor/mentee partnerships to 112 from the program’s inception in 2003. 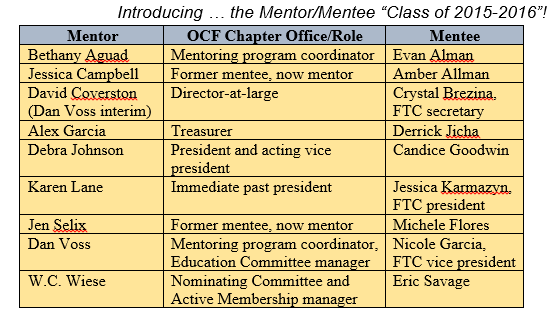 (For the complete roster of mentors and mentees, program coordinators, and FTC presidents from 2003 through 2015, click here). Based on the steady buzz of nine animated conversations across the long table through dinner, this year’s pairings are spot on. After the M&M pairs hammered out their agreements, Bethany quizzed the M&Ms on facts about their partners in a competition similar to the Newlyweds game show. In a photo finish, Jen Selix and Michele Flores nosed out their nearest challengers for the prize—a gift card for Panera Bread, an ideal venue for an upcoming M&M tête-à-tête. 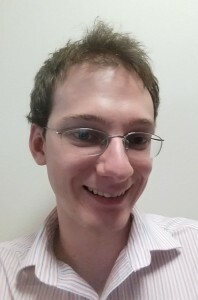 Ba rely 6 weeks earlier, the mentoring program appeared to be on the ropes in Year 13, but stalwart FTC faculty advisor J.D. Applen refused to give up the ghost, convinced the phoenix could rise. He invited Dan Voss and Bethany Aguad, as well as the mentoring program’s 2003 co-founder Bonnie Spivey, to speak to two of his classes on September 15th. Bethany and Bonnie, both former FTC presidents, urged students to re-form FTC and take on leadership positions that become major resume and portfolio items. Along with Dan, they also explained the benefits of joining the OCF Chapter and its longstanding mentoring program to start building their professional network and get a leg up on job search and placement. Not surprisingly, FTC soon had a full slate of officers. At the FTC meeting on October 15, Bethany and Dan worked with the FTC officers and members to lay preliminary plans for the annual STC/FTC meeting at UCF in February, and went away with seven mentee applications! 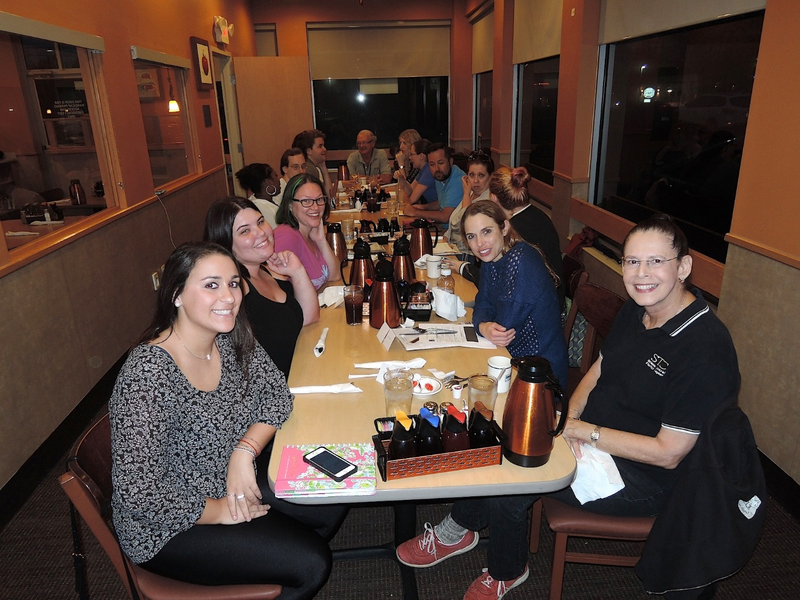 Several of the mentees-to-be attended the OCF Chapter meeting at the IHOP that evening, where the coordinators picked up a grad student’s mentee application and the NTC member’s mentee application, for a total of nine. 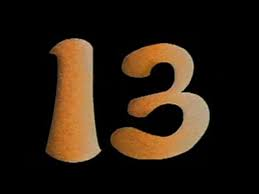 Triskaidekaphobia is not an issue in Year 13 of the OCF/FTC mentoring partnership! of new talent into the OCF Chapter.